Healthy habits play a important role in keeping your happiness afloat, and boosting productivity. From developing a morning and evening routine, to having a checklist at work, habits can improve your overall wellness. So, it may seem perplexing that, in addition to all the ways habits can foster a healthy lifestyle, many of us have certain habits that we'd, well, rather not have to deal with. So how do you break a habit? As human beings, we do things that benefit us in some way. When we build up habits, they probably served us at some point. Even a 'bad' habit is one that has a function — perhaps short-term gratification, even if it leads to long-term suffering. In fact most of us begin to rely on certain habits — like consuming too much caffeine, or taking long naps — as a way to cope with stress. While no habit in and of itself is good or bad, if you're not happy with the way your habits are working for you, there are ways to break them. Once you get accustomed to a certain habit that helps you get through your day-to-day stressors, it can be super hard to ditch — even when the cons clear outweigh the pros. Luckily, there are ways to overcome any habit, from biting your nails, to always running late to work: Here are seven expert-approved tips that you can use to literally break any habit that's holding you back. Research has demonstrated that focusing on how good you'll to feel after following through on a challenging behavior is more effective than focusing on how terrible you'll feel if you don't. It is recommend that you focus on the feelings and positive outcomes you experience after you do accomplish a difficult task, and use this as the fuel to motivate you. So, by thinking about breaking your habit in terms of what that will mean for your future, you can ensure breaking the habit actually sticks. Identify the positive outcomes you are seeking by giving up a habit and make those your focus. For instance, if you want to lay off sugar because you want to feel more focused, visualize yourself getting your work done more productively. Mindfulness may be somewhat of a buzzword, but truth is, that's because the practice is actually extremely effective at improving both your physical and mental health. What's more, science has shown mindfulness and creating awareness surrounding your unhealthy habits can actually help you overcome them. Now all kinds of habits provide you with some sort of gratification, the best way to change a habit is to be aware of it, and then replace it with something else. Then, you repeat this new habit over and over and over again. In a way, by replacing an unhealthy habit with a new activity that you constantly repeat, you are beginning to rewire your brain — and therefore, helping the habit become less of an automatic behavior. Identify what triggers the habit [you're trying to break]; it's usually a feeling like restlessness or boredom. Knowing what begins the cycle of your habit can help you divert your attention to something more helpful. Its suggested that trying out a fitting alternative for a habit could be a process of trial and error before finding what sticks. But, don't give up! Breaking an unhealthy habit can be difficult, especially when habits so often become second nature, and we engage in them without a lot of conscious thought. Consider looking to outside support to keep on track. Having an accountability partner, or therapist, to help identify barriers and reinforce your new habit along the way can be very helpful. If getting unhealthy habits out of our lives was as easy as it's made out to be, we'd all have 'good habits,' and never feel guilty. So, it's important to be gentle with yourself and practice being in a non-judgmental mindset. 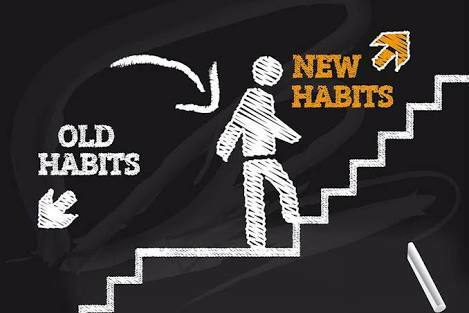 Breaking an unhealthy habit can take time, energy, and, you can be expected to slip up. Being harsh on yourself and invoking extra stress will only make it more difficult to kick your habit for good. The common myth is that you can break any old habit within twenty-one days by replacing it with a healthier one, but mental health professionals suggest this is not quite true. It can vary from individual to individual, and can even be upto six months minimum, and that's only if you're committed to the change. Because of this, having attainable goals is more conducive to breaking a habit than aiming too high: Set realistic expectations. If you've been biting your nails for a decade it's not fair to expect yourself to stop in three days. Set small incremental goals for yourself, and acknowledge or reward yourself when you meet them. This will help you to stay motivated, and minimize giving up.